In a career of 31 years he undertook various positions, securing his first step in management by 1976. Promotions at that time took him to a number of different locations throughout the country, where he held Managerial positions in the retail arm of the business, together with a period of time specialising in the area Lending Operations and headed up a unit in the disposing of repossession properties in the North of England and Scotland. Paul’s last role at the Halifax saw him returning to his home town of Leeds to take up a role as a member of the Senior Management Team in a pioneering Business Centre using the latest workflow and imaging technology. He remained there until September 2000. After a long and established career, he took some time off to take stock of his life and decide on the future. An opportunity arose the following year to join a leading Solicitor’s practice as their Customer Relations Manager which included a wide range of responsibilities including the day to day running of a Call Centre. In early 2003, Paul took the bold step of leaving the practice and travelled to Vancouver Island in Canada to stay with close friends and to research and then formulate plans to set up a career consultancy business to support and guide others in the area of job searching. In January 2004, Peak Career Consulting was launched and is now run as a family business with his wife Kathy. Peak Career Consulting offers a full range of services to individuals of all ages and industrial backgrounds maximising the job searching techniques of today, playing a key role in showing clients how to market themselves in a professional manner. The unique feature of the business is that work with individuals is carried out in their own home, on any day and any time to suit their needs. The benefits from feedback received are that they feel more comfortable in their own environment, which in overall terms provides a more relaxed atmosphere and allows fruitful discussion to take place. In addition to working with individual clients, Peak has also undertaken work with employability projects where groups of individuals have attended a job searching workshop. They have also provided support in the Education Arena on a local level. Key clients have included both the University of Leeds and the University of Bradford. 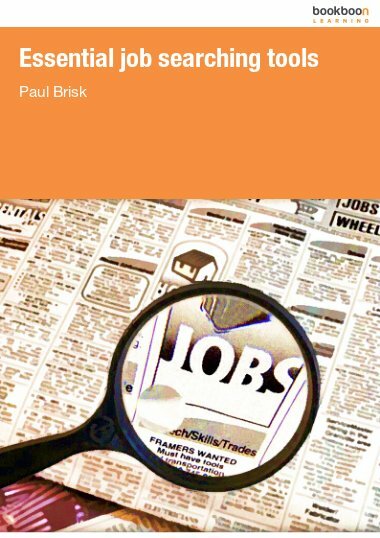 In early 2012, Paul was delighted when bookboon published his first book entitled “Creating your CV as a self marketing tool”. Download this book to enable you to have a key tool to maximise your job searching.